Like it or not I’m back and it’s time for Massive Art Attack once again. I was on vaca last week, so I didn’t have any terrible art to serve up and abuse your eyes with. This week I once again don’t have any terrible art for you, but we do have some very nice alters from a very creative reader, stilledsilence. As I’ve been mentioning in my articles, if you have cool alters that you would like to share send them on in to olwhiskeyboots@gmail.com and I’ll make sure I feature them in an upcoming article. 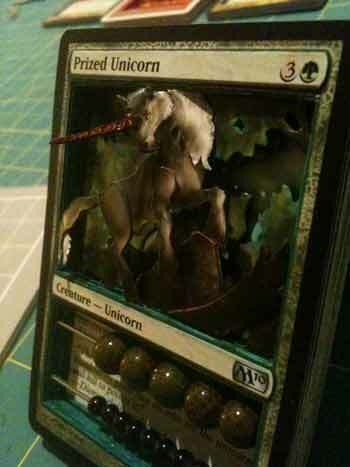 Stilledsilence not only responded to the call, but he also has some pretty sweet 3D alters to show off. Lets take a look. 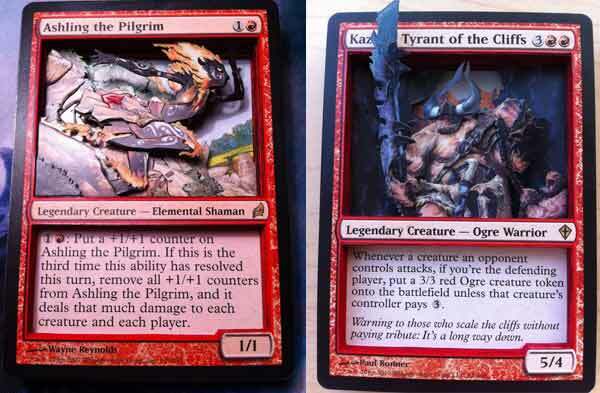 I personally am not fortunate enough to own a hand crafted 3D alter, but I do want to get my mitts on one eventually. If you are not familiar with 3D alters it basically involves taking multiple copies of the same card and cutting each copy differently so that it forms a 3D relief of the cards art. For example, lets take a look at a Tenth Edition Terror. The art here is very solid all on its own. We’ve got skinless man, eating skeleton man, eating living man. Adam Rex nailed this one. 3D movies may be played out, but the alters are still pretty fresh, and you can see the results on the left. A swamp is used for the background while various layers of Terror form the main image. We also get a very handy life counter included in the card itself as well. Much more stylish than a spin down. 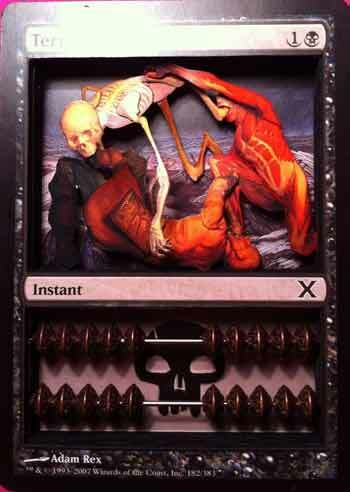 Now that should clarify what a 3D alter is to all of those who were uninitiated, but I bet a lot of readers are somewhat familiar with them since many commander players do enjoy their pimp. One thing about stilledsilence ‘s work that makes it pop out is the level of detail he uses. Also he does something I personally hadn’t seen before. He actually adds shape to certain layers of the card to really enhance the that third dimension as in the Prized Unicorn alter. But how does he get that level of detail in his work? Read on to hear how he does it in his own words. There is a dragon on the blade folks, order now. 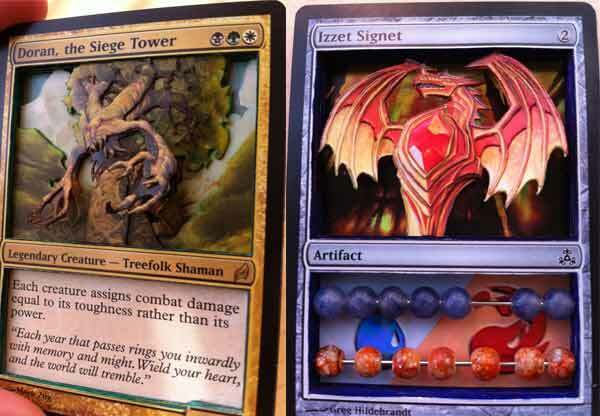 I think the Izzet Signet is my favorite of the bunch. A lot of details on those wings. That’s right he named his child after a Magic character, so you know he’s fully committed at this point, so go ahead and give his deviant art site a look. As always if you have some interesting alters to show off, drop me a line at olwhiskeyboots@gmail.com To follow up my last article I had dug up the art for Hatred during the Brom discussion. At the time I was debating what new deck I should use to build around Hatred. I’ve decided on a budget Korlash deck. Perhaps at the end of the season I’ll deviate away from art for a quick deck list sidebar in case anyone interested in how it came out. I mean seriously, let’s get it right? Thanks for reading. Until next week.